EDIT ￼Chivas Regal announced the first Kenyan edition of Chivas, The Venture, a $1 million global search to find and support the next generation of social enterprise start-ups. 32 countries across 6 continents are taking part and only the most promising from each country will be selected as a global finalist. It is open to any for-profit-start-up that creates both financial value and a positive impact on the lives of others. 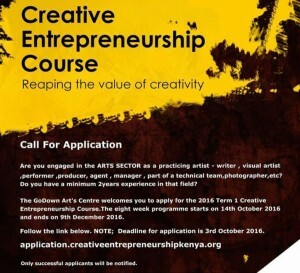 Deadline for Kenyan social entrepreneurs to make submission is 30th November 2016. Kenya’s very own WEFARM, a farming information platform came 2nd at last year’s finals, securing $200,000 for their social enterprise. EDIT Bloomberg Media Initiative Africa Executive Training Program: Intake 4 is now open. This prestigious program has been developed for mid-career journalists, financial professionals with an interest in financial journalism; government professionals responsible for public policy, communications and finance portfolios; and development practitioners and civil society professionals with an interest in African development and financial and economic data. The program value is $22, 000 USD, but Bloomberg Philanthropies with support from the Ford Foundation are generously funding each successful candidate on a scholarship basis. Scholarships include tuition, class materials, lunch and refreshments. 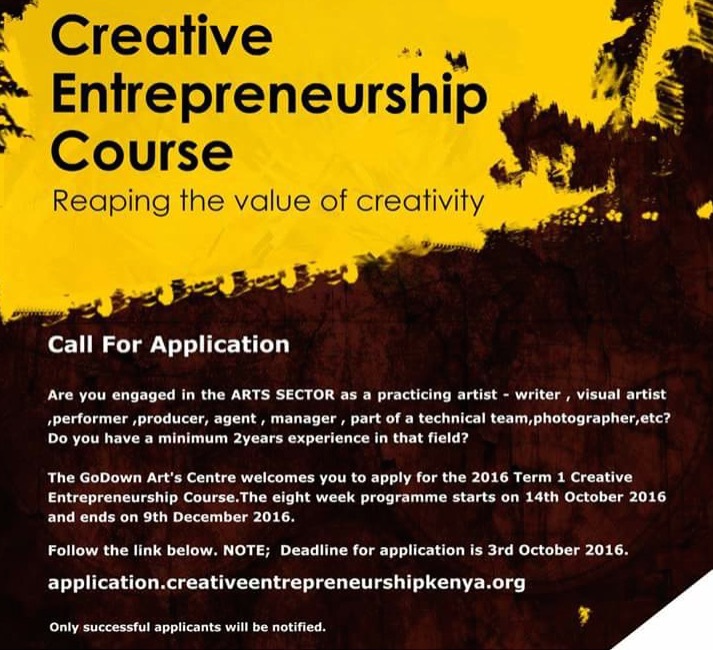 The deadline for initial applications is 25 November 2016. Applications will be reviewed and places awarded on a first come first served basis. The BMIA Executive Training Program will begin in January 2017 and will be offered in Johannesburg, Lagos and Nairobi. EDIT Stanford SEED, which enables East Africa business owners to lead their regions to greater prosperity. The Seed Transformation is a comprehensive year-long program that includes six months of immersive general-management training in Nairobi, Kenya, led by Stanford GSB faculty and supported by trained local facilitators. It is targeted at founders and senior leaders of for-profit companies who want to grow and scale their companies. Deadline 31 October. Vote in the OLX Social Media Awards up to September 22. TED Fellow: Apply to the TED Fellows program, that aims to find a new class of extraordinary thinkers and doers who are aged 21 to 40. The next cycle is from October 4 to November 13. EDIT Also TEDGlobal is returning to Africa at Arusha in August 2017. YALI Regional Leadership Center East Africa (RLC EA) is merit-based and open to young East African leaders. EDIT The Africa Region of the World Bank Group (WBG) is relaunching its fellowship program for Ph.D. students who are Sub-Saharan nationals. The program will increase the diverse workforce that is a priority for the Bank and its clients. EDIT Apply to join the next MasterCard Start Path Global – #StartPath program. MasterCard partners with startups from around the world to help scale their businesses. The program enables companies to gain access to MasterCard’s global ecosystem and to break new markets through relationships with MasterCard and our customers. Some key features include: 6 month virtual program (take part from your home location), 2 immersion weeks at different cities and no upfront equity in exchange for participation. Deadline is October 11. EDIT The Chezo Game Jam Competition is here. Chezo Gaming is an initiative to support the creation of games to address local challenges. The competition will take place from the 30th of September 2015 to the 2nd of October 2016. Winning teams (3) will receive a cash award of € 2,000 (US$2,200) and additional mentorship for up-to 3 months. Find out more here. EDIT The 5th edition of the Pillars of Africa celebrates the extra-ordinary achievements of the young people of Africa, and is open for nominations in entrepreneur, humanitarian, arts & clulture, business icon and sports categories, up to October 28 (via @pillarsofafrica on twitter; or Facebook page Pillars of Africa). Adansonia, a unique pan-African opportunity, gives one the tools to be part of a wide network of similarly minded ambitious entrepreneurs from Ghana to Uganda, from Nigeria to South Africa or Kenya through an intense one-week course by Bocconi Business School, and international pitching event. Africa Business Fellowship places talented American professionals within leading African companies for a minimum of 3 and up to 6 months. Through this joint partnership, Econet (founded and led by Strive Masiyiwa, and also the Fellowship’s benefactor), Africa Leadership Network and MLT will offer this unparalleled opportunity for American professionals to gain invaluable insight and hands-on experience in African businesses. Apply by November 1. Appsafrica Innovation Awards recognise innovation and excellence in African mobile and tech. Supported by Mobile Monday, the Mobile Ecosystem Forum (MEF), Uber and the Mobile Marketing Association (MMA) winners will be announced at the awards party on November 14th, 2016 in Cape Town. Entries will be charged $60 per category that is entered. Start-ups who are less than 12 months old will not be charged subject to approval and can contact us for a discount code. Deadline is September 20. Africa Tech Challenge has 15 teams from Technical Vocational Education and Training institutions (TVETs) in Kenya, Zambia, Ghana and Uganda competing for Ksh 200,000 ($2,000) as well as full scholarships to study for their Masters’ in top engineering universities in China. AVIC says the Africa Tech Challenge has armed over 290 students with technical skills. At the AGRF 2016 in Nairobi in September 2016, commitments were made to fund African agriculture with $30 billion, including $24 billion from the African Development Bank, $5 billion from the Gates Foundation and $3 billion from the International Fund for Agricultural Development. Advance Africa has several opportunities including British Chevening scholarships for international students to study in UK. Government of Kenya scholarships to study in the UK, China, India, Mexico, Brazil, Russia, Oman, Hungary, Cuba, Slovakia, Egypt, Korea, Morocco, Ireland etc. GSMA Ecosystem Accelerator Innovation Fund is now open for applications from start-ups in Africa and selected Asian countries, offering funding: grants of between £100,000 and £ 250,000. Applicants must provide a matching of at least 50% of the amount of funding requested Deadline is 18 September. Heva Fund: HEVA is ready to receiving applications for its investment cycle, investing between KES 100,000 and 1,000,000 to help creatives grow their businesses. Advance Africa has several opportunities including Mo Ibrahim Foundation fellowships for young Africans. Apply to Pitch AgriHack to win investment for your e-agriculture start-up! The Technical Centre for Agricultural and Rural Cooperation ACP-EU (CTA), in collaboration with the African Development Bank (AfDB) and the support of partners including the Centre for Agricultural Bioscience International (CABI) and m:lab East Africa, is launching the pilot edition of Pitch AgriHack, a new component of its AgriHack Talent Programme. The entrepreneurs should be owners of an already developed e-agriculture/ICT4Ag application or platform. Two categories are available: Early stage platform and Advanced platform. Winning teams will receive a cash prize of up to €15,000, as well as promotional support, additional capacity building and networking opportunities. For More. Rockefeller – Africa Centre, Artists In Residence (Bellagio) program is seeking applications from high calibre African artists, in different stages of their career development (from emerging to late career), who are provocative, innovative, and are stretching the boundaries of their artistic practice. The residencies are available to composers, fiction and non-fiction writers, playwrights, poets, video/filmmakers, curators, visual and performance artists. Application deadline is September 30. This entry was posted in ADB, ideaexchange, Rockefeller, scholarships, tedglobal on September 16, 2016 by bankelele.